They also had a request: keep it fun. 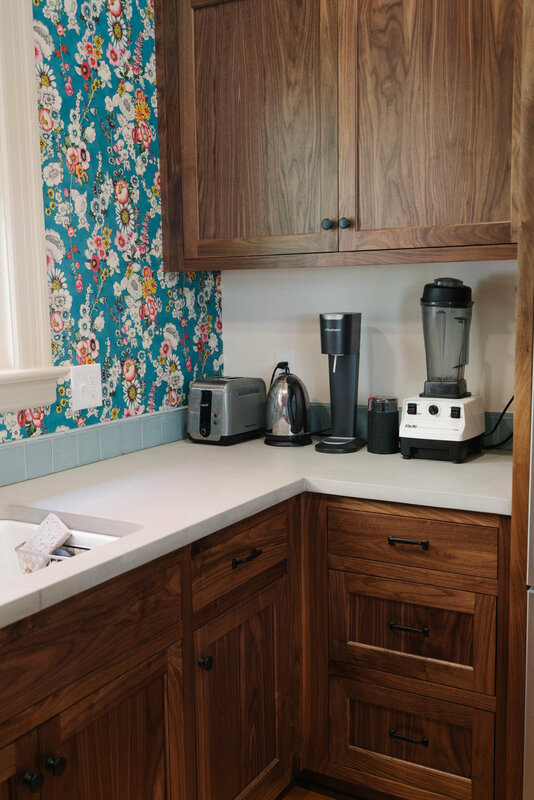 Taking inspiration from their tradition of having friends and family draw flowers in Sharpie on the kitchen wall by the back door, we helped them "keep it fun" by selecting funky floral wallpapers while designing a kitchen that would honor the historic style of the home. 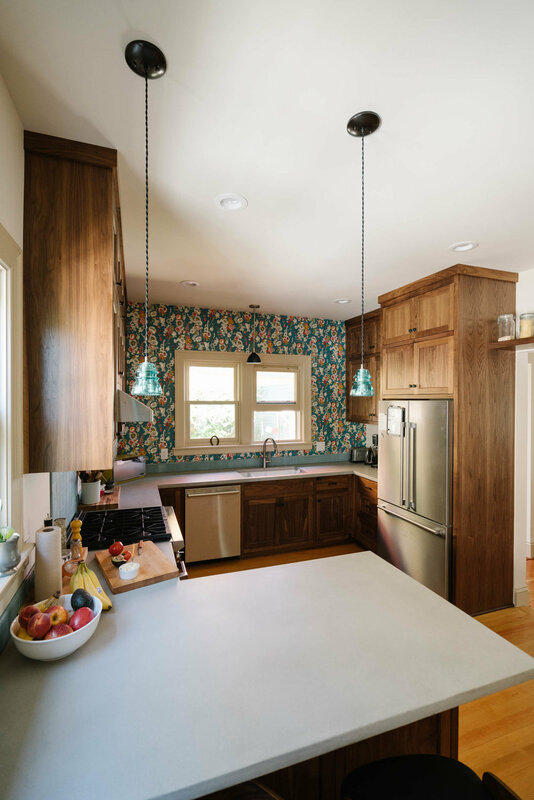 By removing an oddly placed overhead beam and altering the access to the backyard, we were able to create a U-shaped kitchen with better function and that perfect work triangle. Inset cabinetry is in keeping with the style of the home, while solid walnut doors and natural concrete counters keep it feeling modern. A wide opening from the kitchen into the dining room provides good connectivity. Cabinets and an overhead display shelf flank the passage. Built-ins in unique locations optimize storage. Designing a custom kitchen allows us the opportunity to design around a client's need. In this high-use kitchen, having easy access to favorite appliances means proper cabinet height is of great importance. Access to the backyard had previously been through the kitchen. In the new U-shaped kitchen, the cabinets form a natural barrier, allowing for a more logical shift of the back door to the center of the mudporch. Although the mudporch became smaller, it became much more functional as well. A new built-in cabinet for shoe storage and drawer for gloves is conveniently located in the mudporch. This feature recesses into the kitchen cabinet run, utilizing the typically wasted space in a lower corner cabinet. 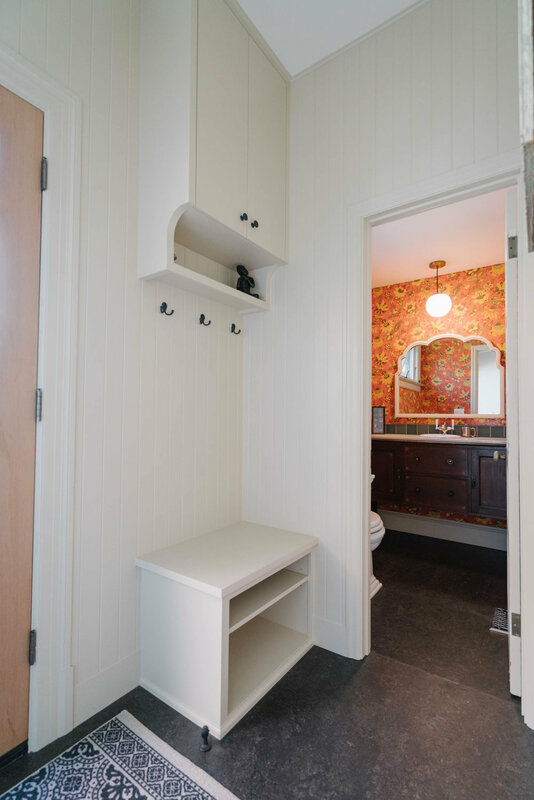 A sweet powder room off the mudporch was wrapped with a wallpaper featuring some of the same tones as the wallpaper in the kitchen, creating a cohesive feel through the entire remodel. This vibrant little space is now a destination with big presence.